When you go camping or hunting you suddenly think of a tent. You think of how packable it is, how repellent to the elements, how easy/difficult it is to store or carry around…How much time you need to install it, and so on. Actually, you have an option and it’s not a common choice, we give you that! 0.1 What’s a hammock tent? 0.2 Why get a hammock tent? You need to take a step back and think a bit outside of the box when taking in consideration a hammock tent as your next hiking tent. Even though it has a minimalist design, the hammock tent is not less comfortable than a typical tent. On a plus, it brings more joy and fun to lay in. It’s also easier to set up and take down than a classic tent. But, the most important step when taking a hammock tent on your hunting trip is not to set it up, but to take a deep breath and try something new, totally out of your comfort zone. Why get a hammock tent? This might seem incredible, but your sleep is so much better in a hammock tent, trust us on that. You simply need to install the hammock tent right, and to get ready for your best sleep when hiking ever. The hammock tent is so great for your sleep that you won’t be missing your bed at home and will feel the change for the better immediately. No matter how even the ground may seem, there will always be some weirdly shaped rocks, some tree roots to ruin everything… The hammock tent takes this stress away as floating in the air doesn’t come with any rocks or pointy roots between your ribs. Contrary to what people think, finding the right spot for your hammock tent is not that difficult and what the ground is like doesn’t matter at all. If you get a hammock hanging kit, there’s no need to find two perfectly spaced trees. You only need to adjust the hook on your hammock into the straps for the best distance and… hop in. Best thing on a hammock tent is that… you only need to take a deep breath and enjoy nature’s pure air. There’s no point in going outdoors and staying inside, when you can go and enjoy the the deep starry sky from a hammock tent. It might look like a hammock tent gives you just a place to lay down, but most models feature nowadays a mosquito net, a hammock tarp and even a hammock gear loft for your belongings. Some might worry about the cold weather and think that a hammock tent is only for when going to the beach. 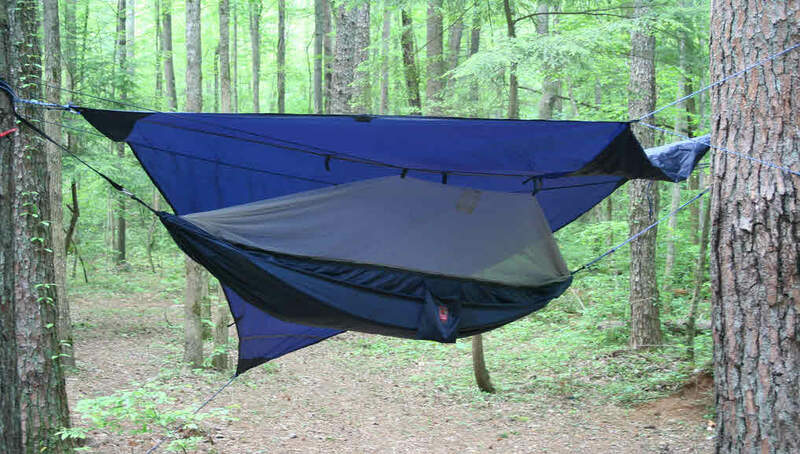 As a matter of fact, if it gets colder, you can use a hammock rain fly that reflects heat. If you’re still very cold, you may get more accessories for hammock camping in the cold weather. Like every piece of equipment or clothing that you have for your outdoor hobby, you know that you need to invest some money, especially in the beginning. The good news is, you can get all the basics you need for your hammock tent with not so much money. The more you’re willing to pay, however, the more accessories you can get in order to feel most comfortable, no matter what the season or weather conditions. Your hammock tent is not just the replacement for your tent or a place to sleep. Once you get yourself a hammock tent, you know you got a camp chair, a hanging place or a place to read books. You may snuggle in it with your friend or let the kids swing for a while… After all, kids love swings!! You may use your hammock tent not only when going hiking, but also at home, between two trees or cars. Versatile, lightweight, fun and yet more reliable than you’d think, the hammock tent is a great solution for anyone who loves breathing the fresh air, day and night. If you have never tried a hammock tent before and you feel it’s a bit difficult for you to sleep in this kind of tent, then this model is the one to go for you. As it features a flat surface, this doesn’t give the same feel as a typical hammock does. There’s comfort, but it’s not the same type of comfort. But for the money you pay, you get a good, popular hammock tent that gives good comfort by its flat surface, and not the “banana” sleep that other hammock tents give. As you already have been falling in love with hammock tents, and whenever you go camping you only use that, maybe you want to be closer to your life partner when you take the night out from hiking. The oversized ripstop nylon rain fly protects you and your gear from the rain. As you can see, there aren’t many things to complain about the Sky Tent. You just need to understand exactly what it is and what it’s used for! When you still want to try the experience of the hammock tent but don’t want to get one that costs an arm and a leg, try this lower priced hammock tent. When it comes to the things we didn’t like, we can’t think of many. As it keeps water and bugs away, the hammock loses on breathability, but that’s totally understandable. When a hammock for two isn’t enough, take a look at this innovative and brand new tree tent for three. But, for a three adult tent above the ground, this is a great option anytime! When your budget is not over the top but still want a good quality hammock, the Eagles Nest Outfitters Junglenest hammock could be your no.1 option. All in all, this is still a great hammock for backpacking, protecting you in many situations and keeping you comfortable and bite free. If you’re the stealthy type, you may want to have a look at our bivy tent page for more options.